The theater in Freyming-Merlebach instigates an energetic dialogue with the urban landscape; it folds to adapt to the context and logic of its traffic flows. Placed on a plinth, it stands alongside the new municipal offices; the unusual arrangement of its volume gives it an elegant silhouette, the lines of which ensure visual transition between the various parts of the project while respecting the scale of the town. Visitors have the advantage of the animated interplay of volumes: in the upper section the foyer curves round to channel visitors towards the entrance, while in the lower section transparent areas allow glimpses of the wealth of internal traffic routes and constitute an invitation to come inside. This generosity is also to be found inside the building. 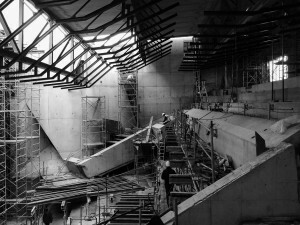 In the auditorium, each member of the audience enjoys optimum visibility; the transition areas are flooded with natural light, varying with the movement of the sun. 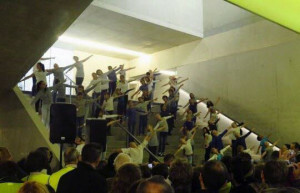 This evolutive, dynamic spatial arrangement echoes the very image of the theatre. 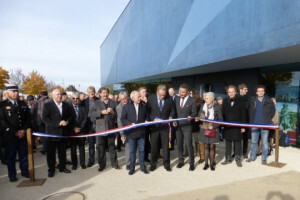 The pantographe Art and Conference Centre, Inter-Generation Centre, and Tourist Office opening, toke place october 24th 2015 in precense of City Council Patrick Molinoz, local representatives, engineers, construction companies and main designers. Vom 25. 9. bis zum 24. 10. 2015 finden in Deutschland, Frankreich und der Schweiz die 15. Architekturtage zum Thema "Architektur im Licht" statt. Innerhalb der vergangen 15 Jahre haben sich die Architekturtage als Höhepunkt im kulturellen Geschehen des Oberrheingebiets etabliert. Jedes Jahr im Herbst findet das vom Europäischen Architekturhaus Straßburg organisierte Festival statt, nicht zuletzt dank der Unterstützung seiner kulturellen Partner und einem stetig wachsenden Publikum (50 000 Besucher im Jahr 2014). Wo ist der Platz des Lichtes in einem Gebäude? Wodurch zeigt sich das Spiel von Licht und Schatten in der Architektur? Welchen Stellenwert nimmt das Licht in der Architektur ein? Um diese und zahlreiche weitere Fragen wird es in der diesjährigen Jubiläumsausgabe der Architekturtage gehen. Eine ganze Reihe der Veranstaltungen zu den Architekturtagen wird auch dieses Jahr wieder im Architekturschaufenster stattfinden - eine Übersicht finden Sie im Folgenden -; alle weiteren Veranstaltungen im Stadtraum Karlsruhe gibt es darüber hinaus HIER zu sehen. Unbedingt reinschauen! The opening of the Nursery in Buhl will take place on Saturday 12th September at 9.45 am in the presence of Marc JUNG, President of the Community of Communes of the Guebwiller Region, Eric Straumann, President of the Haut-Rhin Departmental Council and other local personalities. Passive building of 704 sqm offering 40 places intended for the population of the top of the valley. 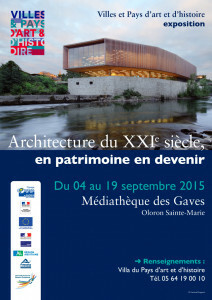 The Villa of the Country of Art and History of the Pyrenees Béarnaises offers, on the occasion of the European Heritage Days, in Oloron Sainte-Marie, an exhibition on contemporary architecture. Indeed, the theme chosen this year by the Ministry of Culture is "21st Century Architecture becoming architectural heritage". 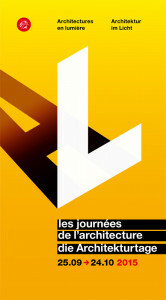 The Media Library will host the exhibition composed of photographs. The aim of this exhibition is to show how cultural facilities are genuine creations that meet functional needs but also integration into urban planning programs - whether or not in a protected area, (including the dominique coulon & associés Library and theater in Isbergues. This exhibition will be complemented by the distribution, in the auditorium of the Villa of the Country of Art and History, of documentary films on the Sendaï Media Library and on the Guggenheim Museum in Bilbao.